We exhibited at the Mid Sussex Business Expo recently at Ardingly Showground. Emily (office manager) joined me (David, editor) in spending the day talking to potential advertisers and also hearing about potentially relevant stories for our three community magazines in Lindfield, Cuckfield and Hurstpierpoint. The Chairman of Mid Sussex District Council has marked the exceptional work of community spirited individuals from throughout the district with a special awards ceremony on Sunday 16th September 2018. Each year, Mid Sussex District Council invites its Members, and town and parish councils, to nominate residents who dedicate their time, skills and energy to enhancing the quality of community life. Today we welcomed Emily Billson into Kipper HQ in Haywards Heath. Emily will be keeping the office on an even keel by organising and booking in advertisers who wish to take space in our local community magazines - published in Hurstpierpoint, Lindfield and Cuckfield, as well as refining some of our internal and external business processes. When you phone in, to say hi! This month we finally launch our third title - Hurst Life - which we look forward to being welcomed into the amazing community of Hurstpierpoint in West Sussex. We are looking for any local stories happening in the village, but also any businesses that are looking to promote and advertise their products and services to Hurstpierpoint and beyond. With our excellent blend of ultra local content alongside your adverts, we have created magazines which will genuinely stay around on residents coffee tables for the whole month. Contact us for more information about advertising your business to Hurstpierpoint. As we seek to make the improve our response times to new advertiser enquiries and also contributors wanting to discuss articles in the Cuckfield Life and Lindfield Life magazines, we have just employed Matthew Buss as office assistant. If you call the office, you'll probably be speaking to him! The Gatwick Diamond Business Association (GDB) will soon be sending out their latest Update magazine - a bi-monthly publication that keeps members up to date with the association, but also with changes and news from within the membership. At Kipper we created the new look Update magazine and worked closely with Jeremy Taylor in handling the copy for it between us, and getting the look and feel right. In particular he was keen to ensure there was still a little something quirky about GDBs magazine, so the company mascot (called Munki, pictured) makes a couple of appearances following his photoshoot session at GDB HQ at Basepoint in Crawley last week! I recently embarked on a trip to The Design Museum. I have had a secret love of motorway signs for some years now - having admired their sheer scale when dashing past them at 70mph. So to get up and close to one was pretty cool! The motorway sign system was designed by Kinneir Calvert in the 1960s, with a need to be legible from 180m away - hence their size. 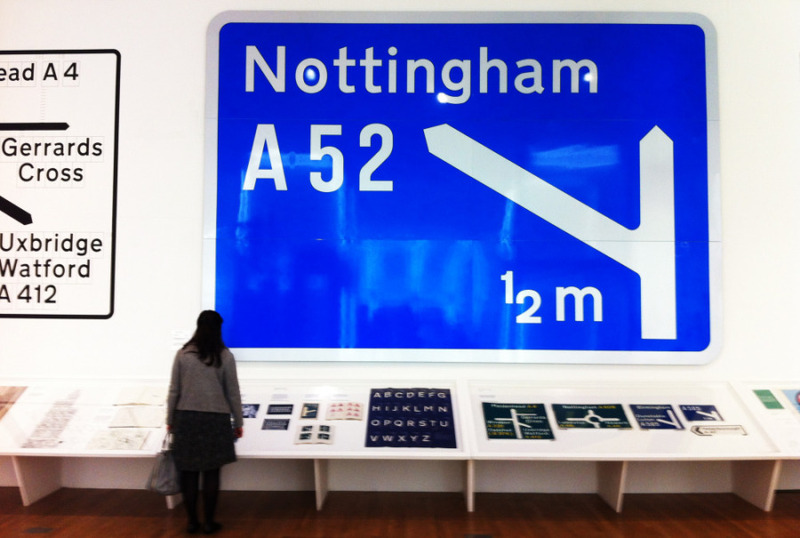 The M1 Motorway signs was a test case for the designers, which, after its success, meant that they went on to design and unify the entire road sign system - which we still use today. The font, Transport, was specially designed for this usage. I think the thing I love about it is the scale. BIG typography. (I'll blog about car park signage another time!) All of this proves that the best signage in the world is both simple and clear. The BIG Mince Pie Mash Up 2011.... Results below !!! You may have seen it on our Christmas cards by now, but this is the moment that we got all creative and enjoyed a bit of pre-Christmas decopatch. Decopatch is a simple process; to do this we used one Apple magic mouse (its better if its already broken! ), a small amount of nice wrapping paper, some watered down PVA glue and a paint brush. Simply brush the glue onto the surface first, then begin laying small pieces of ripped paper onto it. Use the brush to stick it down, by painting glue on top of the paper. After a while you'll be done. Leave overnight to dry. And, hey presto; you got yourself a mouse decoration! Warning, it probably won't work again after this treatment. Although we found a great new use for it is on the top of our Christmas Tree! A recent trip to a Mercedes dealership for my Smart car called to mind the importance of customer service. I was greeted by name in the car park, and shown to the reception. Whilst waiting for my car to be serviced, I was continually asked whether I wanted another drink. In fact, I rather enjoyed the peace and quiet of the showroom to get some work done actually! The service manager assigned to my car kept me well updated with the progress, and apologised for the time it had taken. When it was ready, I was well fed and watered and the car had had a full valet inside and out. Plus, when I got to my car there was a notice inside the car which apologised that they may have moved my seat - as if they had to apologise! Anyway, the point is Mercedes is an iconic brand, and one renowned for its quality. As a customer it certainly lived up to its reputation, and led to great satisfaction on my part. This is where brand strategy goes far past just a logo! What role is your image having in your business’ fight against the gloomy financial climate? It is, undoubtedly, a tough world out there at the moment for many businesses. With the constantly changing global forecasts and economic statistics buzzing around the media it can be confusing and very daunting to consider the state and position of your business, within the bigger picture. However sometimes it’s the smaller picture that provides more clarity. The small picture is your business, and when you look very carefully at the things that are in your control, it can become much easier to deal with. The former Sector Skills Development Agency carried out research which showed businesses that don’t invest in growth during a recession are 2.5 times more likely to fail than those that do. When times are tough, it may be tempting to cut the marketing budget, but it seems that this approach is not always the best plan. At Kipper, one of the first things we do with new clients is to carry out a design audit. Put simply this is getting everything out on the boardroom table (flyers, website, product labels, business cards, adverts etc) and reviewing it together. Your customers will come into contact with your business through a variety of different avenues: they may see bus advertising, walk past your showroom and get a flyer through their door. All these ‘touch points’ should give a clear and consistent message. To continue our example; spending money on the design of your flyers may be wasted if your bus ads don’t convey the same great impression. People may tune out if they can’t see consistency of brand; they may even not link the two! Design can play a key role in your businesses success and add value to the bottom line. If you are interested in having a free design audit for your company, call Kipper today on 01444 884115. Canon Pixma: Bringing colour to life from Dentsu London on Vimeo. To promote Channel 4's new series Seven Dwarves – an observational documentary "following the lives of seven dwarf actors as they live together and perform in a production of Snow White" (we're not making this up) – 4Creative has subverted the notion of a huge billboard campaign by creating 20 mini poster sites. 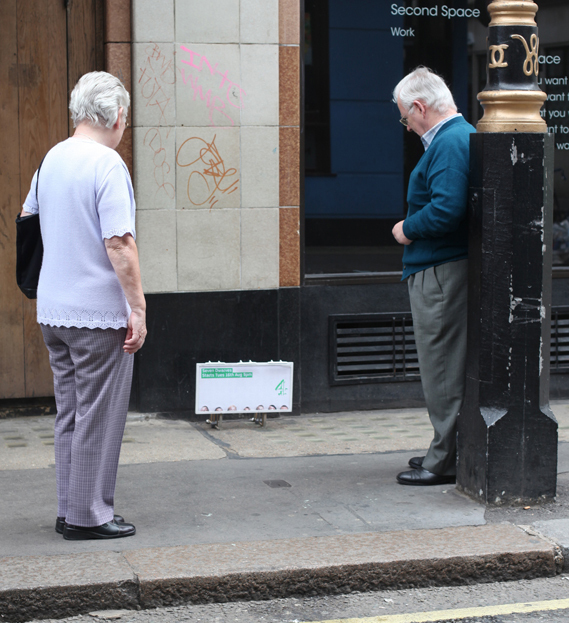 Twenty of the miniature billboards, each a perfect scale model of a 48-sheet poster site, complete with working lights and a stand-alone frame, have been placed in various locations around London over the last week or two including Cromwell Road and Picadilly circus. A rogue with an eye for salvage - and the ladies - Ray: A Life Underwater is an affectionate portrait of one man's deep sea diving career, told through his extraordinary collection of marine artefacts. Like a modern-day pirate, 75-year-old Ray Ives has been scouring the seabed for treasure his whole life. The former commercial diver has plundered the deep for over fifty years, bringing to the surface anything that glittered -- even gold. In a shipping container near the water, Ray tends his museum of cannon, bottles, bells, swords, portholes and diving gear. He even still takes to the water in a 1900s diving suit. Today we found this beautiful new stop motion ad for Mexican food chain Chipotle by London-based Johnny Kelly, set to a Willie Nelson cover of the Coldplay song, The Scientist. The video features the story of a farmer seduced by profits into large-scale unsustainable and unhealthy farming practices who decides to go “back to the start”, ridding the farm of its factory machinery resulting in happier and healthier animals. Kipper village welcomes Louise Richardson to the fold today! Louise graduates from University of Brighton this summer. Stephen and I very much look forward to having someone else who cares about baseline text alignment and RGB/CMYK colour variations in the office! Team Kipper enjoyed time out of the office to visit Johnston Press' printing plant at The News Centre, Portsmouth today. It was organised as part of a community project Kipper is involved with as a partner with Oathall Community College, as the school seeks to publish their own newspaper in September. The printing press prints weekly and daily newspapers such as The News (Portsmouth), The Mid Sussex Times and national paper; The Sun, at a rate of up to 86,000 copies per hour.